When you think about story time, does your mind automatically go to the library or to the preschool classroom? In my searches on Pinterest for "story time" I've found an abundance of boards, lists, and links dedicated to library and classroom story time ideas. I've even come across countless links to homeschool blogs. What seems to be lacking is practical advice aimed at the parent reading with his or her child. 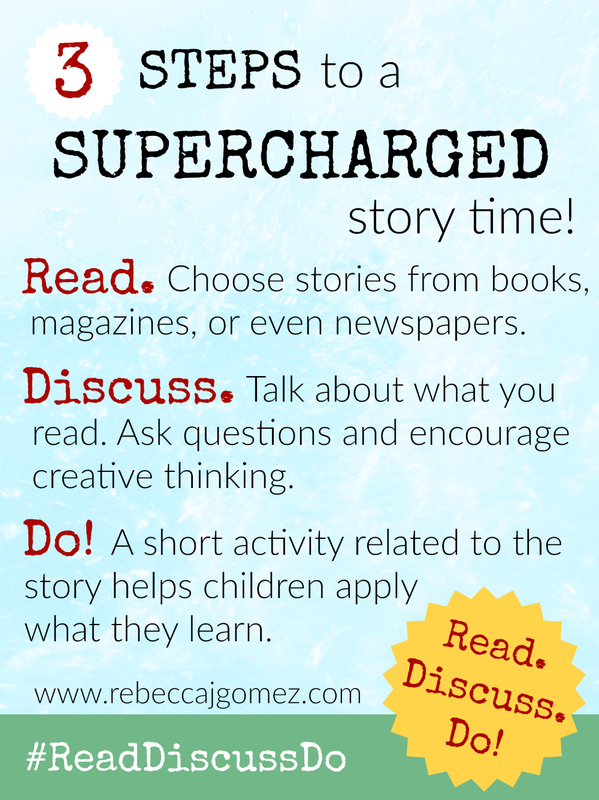 Story time is not just for the library or classroom. Much of the advice on the web that is aimed at librarians and teachers can be useful for parents reading with their children as well! But there is so much of it! Even as a self-proclaimed story time enthusiast, I can get a bit overwhelmed by all the talk about reading readiness, extension activities, and comprehension...oh my! Read a book. Talk about the book. Do a simple activity inspired by the book. That's why I began a social media campaign called Read, Discuss, Do! 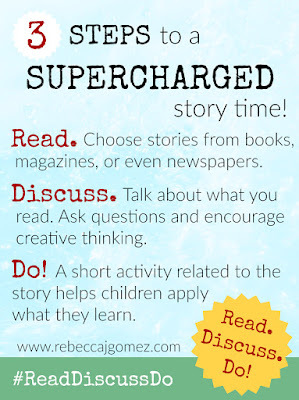 My goal with this campaign is to offer simple, book-specific discussion and activity ideas that can be used by anyone -- caretakers, educators, librarians -- to "supercharge" story time! If you'd like to see what we've been up to, check out the #ReadDiscussDo hashtag on Twitter and Facebook! I would love for you to participate with stories and ideas of your own!